Restrictions on children’s independent mobility are having an increasingly negative impact on their healthy development. Many children are not allowed to venture out alone or even with their friends as the previous generations did. This pressing issue must be addressed by rethinking the design of the urban public realm to better serve the needs of children and families; ultimately, to create a new, inclusive culture of place. 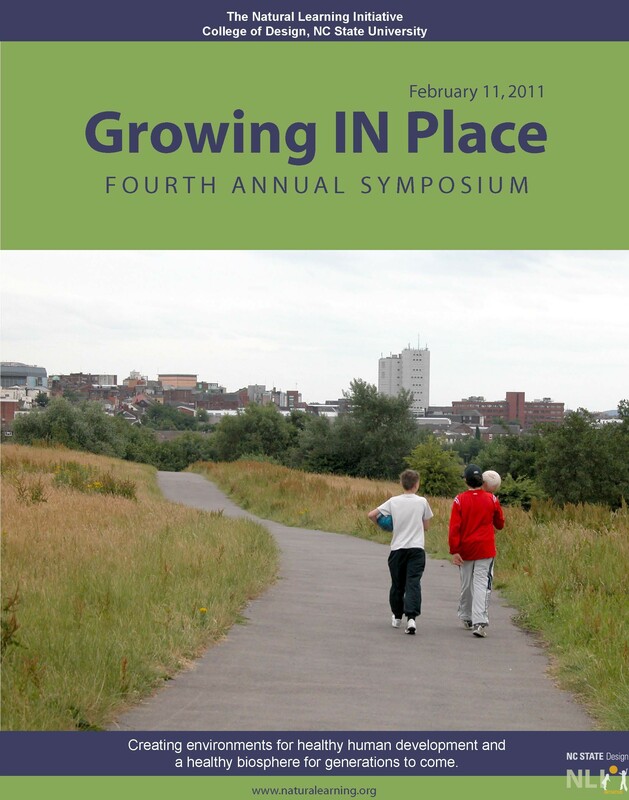 The aim of the Growing In Place Symposium is to stimulate discussion about how planners and designers can enhance the health and well-being of urban families in North Carolina, across the nation and world. As urban growth increases, new urban design policies are required to support the needs of citizens across the life span. The Growing In Place Symposium will explore these themes. Mitchell Silver, AICP, Director of the Department of City Planning, Raleigh, NC. Welcoming remarks. Robin Moore, MCP, ASLA, Director, Natural Learning Initiative, NC State University, Raleigh, NC. Permeable urban neighborhoods: Designing shared feet and bike “flow space” for children and families. Perry Bigelow, Bigelow Homes, Aurora, IL. Designing neighborhoods for children and families: How can we get the development community on board? Jason Gilliland, PhD, University of Western Ontario, London, ONT. Creating urban design policy for healthy childhood neighborhoods: What does built environment behavioral science tell us? Michael Wallwork, Alternate Street Design, P.A., Orange Park, FL. Balancing motorized and nonmotorized transportation in favor of independent mobility for children: Design solutions that work. John Ackerman, CEO, Occoneechee Council, Boy Scouts of America, Raleigh, NC. Motivating kids to get outdoors in search of adventure: Managing the inherent risk. Abby Ehrlich, Director of Parks Programming, Battery Park City Parks Conservancy, NYC. Animating the urban public realm: Programming urban play. Panel discussion. Moderated by Robin Moore. Creating healthy urban environments that motivate kids to get outdoors. What critical policy changes are required?